Sun block is used all year around. However especially for the summer time you need stronger one. It is strong on water and sweat. It included fine glitters and created speck. The texture is more like watery lotion. It really applies well and softly. It applies smoothly and turns out powdery after. Like the ordinary sunscreen it gives a feeling of heavy and some cover on top. However this is really light! 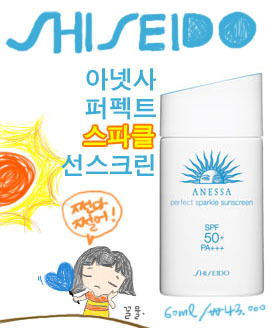 You can see that Shiseido sun care products are for oily type skin. The over all finish is very matt. Also middle skin type people can use this. I don't use this when I am doing makeup. For the middle skin type when you use this without primer and base, it works like primer and helps the makeup to settle. when you even use very moisturized foundation, you can’t find any moisture. It sets the foundation in a mat texture. So instead of looking healthy it looks more like glue was applied to stick something. If you like the matt finish and a makeup that sticks well I want to recommend but for the people who likes to do makeup like me is not suggested. When I don’t wear any makeup I use this because of the fine glitters inside. The glitters shines off very nice and it said to be three different glitters inside but I can’t seem to differentiate. It is strong than I thought but it isn’t a rustic looking glitters. The fine glitters brighten up the face. When you have like this kind of sun block and foundation with great concealer you can enjoy your summer. When you are using this shake it before. This is also good for men to use. If is SPF 30 15x30=450 (SPF 1 is 15min) so it means it can protect around 7 hrs. Aside form summer season SPF 30 is enough. However during the summer season it is good to use about SPF 50. It is better to apply again after when you are doing out side activities. Apply the sunscreen 30 min before you go out. The sun ray that provokes the aging. It is the protection of sun ray A. So the + sign after PA is protecting your face 2~ 4 times and if there are 2 it protects from 4~8 times. So if there are +++ it is 8 times. Don’t think your safe that you applied sunscreen over all one time. The more standing facial structure like forehead, nose, cheekbones, and ear apply one more time very lightly.